As I stood in line a few weeks ago at Magnolia Bakery to pick up some birthday treats for Paul, I found myself in conversation with a local about the weather and how spring-like it was already feeling. I told him how upsetting it was that I didn’t realize we’d already had our last snow and I didn’t honor it in some way. When he realized I’d only been here a few months he warned me not to get too comfortable. “March can fool you” he said. And fool me it did. The first week of Spring brought us snow. Monday – the first full day of Spring – wasn’t too bad, just gloomy. Tuesday was bright and sunny then Wednesday started with some sleet then later in the evening the tiny chunks of ice tap-tapped on our windows and Thursday morning real snow. The cars were covered in a thin layer which slid away as they drove down the street. What a nice way to start a new season. Snow loved us so much it wouldn’t just drift off into the sunset quietly. It was a refreshing reminder of how wonderful living in New York is. I paused and took it all in that morning. This time I’m sure the snow won’t come back and I was sure to appreciate it. It didn’t last very long and was all melted by the Spring sun elbowing it’s way back into control that afternoon but it was fun while it lasted. The cold has stuck around. This weekend we had a taste of 20s again! I felt so cold on Saturday that I didn’t warm up until Sunday! I was sure there hadn’t been a colder day all these 5 months – but of course there have been colder days. I’d just gotten comfortable with the warmer temperatures. When we first moved we eased into the frigid weather but this week it seemed to hit me without warning. But spring really is here, and it has brought many bright colorful friends. 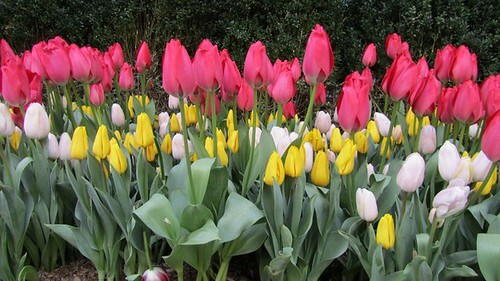 The streets are lined with tulips and daffodils sprouting. The Macy’s Flower show was setting up on Friday as we walked by. Cold or not, the sun is shining brightly and the flowers are still blooming. 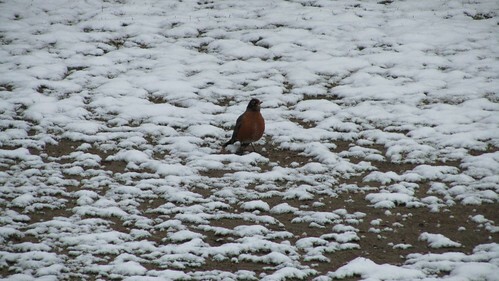 This entry was posted in everything i've blogged, observations and tagged pretty, snow, spring. Bookmark the permalink.